With a runner at second base in the fourth, Casey Kotchman takes Mat Latos deep. Mat Latos thinks the Indians were stealing his signs. To judge by the evidence, he may be on to something. When Cleveland had runners at second, possibly peering in to catcher Ryan Hanigan’s signs and relaying the information toward the plate, hitters were sitting on what Latos felt were good pitches. After reviewing video, he said that the Indians hit the ball significantly better with runners at second base than they did otherwise. With Shin Soo-Choo at second in the fourth inning, Hanigan changed things up. What had been the sign for a curveball turned into the sign for a slider; Latos said that the next hitter, Asdrubal Cabrera, was subsequently looking for a breaking pitch and got jammed. All of this, of course, could be mere coincidence. It could also mean that Cleveland is a team that likes to know what’s coming. Either way, it doesn’t much matter. A team’s primary recourse in such a situation is to change signs, and that’s exactly what Cincinnati did; the following day, the Reds held Cleveland to three runs over 10 innings. Even Latos, who was more outspoken about the practice than most pitchers who are similarly (allegedly) victimized, was quick to admit that his lack of sharpness prevented stolen signs from being his primary issue. And he didn’t come anywhere close to threatening retaliation. Then again, Baker also made the point Tuesday in an MLB.com report that “you don’t really have to steal signs when the ball is over the heart of the plate and up”—which it most certainly was for Cleveland on Monday. Indians manager Manny Acta denied that anything was amiss. Acta is certainly correct about the negative repercussions, but there’s no way he actually thinks that only three-quarters of a player (yep, that’s the math on 99.9 percent of 750 big leaguers) wants to know what’s coming. There are certainly some holdouts and guess hitters out there, but it’d be a safe bet to say that at least half the hitters in baseball would jump at that type of advantage. There is also another possibility to explain Latos’ frustration on Monday—one that could hurt the pitcher far more than the occasionally pilfered sign. 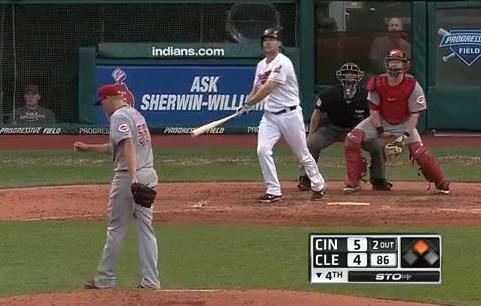 “Tell [Latos] you don’t have to steal signs when you’re tipping pitches,” said an unnamed Cleveland hitter at MLB.com. And so the intrigue begins anew.